We’d love your help. 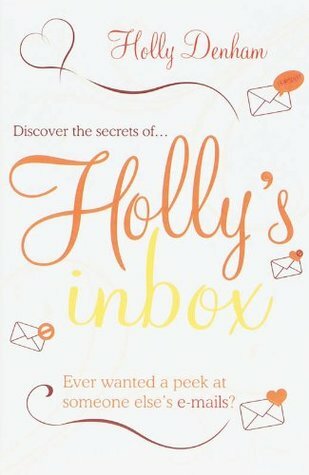 Let us know what’s wrong with this preview of Holly's Inbox by Holly Denham. Meet Holly Denham. It's her first day as a receptionist at a City investment bank and, with no cooperate front-of-house experience, Holly is struggling to keep up. Add to this her mad friends, dysfunctional family and gossipy colleagues, and Holly's inbox is a daily source of drama, laughter, scandal and even romance. But Holly's Ever wanted a peek at someone else's emails? To ask other readers questions about Holly's Inbox, please sign up. Frankly speaking, these days I'm totally into funny, hilarious, light-read kind of books, first, they are cheap and easily available and of course, you can finish reading this type of book just in a day! Another hilarious and funny one that I finished reading is Holly's Inbox by Holly Denham. So if you're feeling gloomy these days, this book is surely going to lift your mood up and will certainly make you feel happier and lighter. But one disadvantage, this book is way too long, more than 700 pa Frankly speaking, these days I'm totally into funny, hilarious, light-read kind of books, first, they are cheap and easily available and of course, you can finish reading this type of book just in a day! Another hilarious and funny one that I finished reading is Holly's Inbox by Holly Denham. So if you're feeling gloomy these days, this book is surely going to lift your mood up and will certainly make you feel happier and lighter. But one disadvantage, this book is way too long, more than 700 pages, and on the positive note, it's written in an e-mail form, so it's quite easier and faster to read than any other 700 pages books. I finished reading this one, just in few hours!! This book is about Holly Denham, a receptionist, who managed to get her job in an investment firm in London, by embellishing her C.V. Her whole life is shown in her inbox, how she makes new friends in the firm, how she keeps in touch with her old ones and her old life, and how she keep up with her completely mad family, seriously each and every one is a total nut. Well I never got to know how Holly looks like, but I do got to know her personality through these e-mails and trust me you'll love her. And as reviewed by the "Entertainment Weekly" that this is next Bridget Jones. Read this one and find it for yourself, because once you started the book, it's really hard to put it down. This book is from the UK–published three years ago, and was only recently published in the United States. It popped out of the table at me in my Barnes and Noble. I went to pick it up, thinking it was a thin, chick-lit novel…it is a brick. I almost dropped it because I wasn’t prepared, and I was laughing (out loud, by myself). I knew I had to have it; a thicker than thick, total chick-lit, British novel—SOLD! Did I mention it had a recommendation by OK! Magazine on the front cover (that’s the British version of US Weekly only better)? It was exactly the kind of light read I was looking for to get me through the end of the “year” (the beginning and end of the school year—ok, and all the times right before a vacation, too—are mad…completely exhausting and stressful) last year as I was ending my last teaching job. Can I tell you how fun this book was to read. First, it’s always fun to read e-mails and letters (who doesn’t like getting letters? And who doesn’t remember The Jolly Postman and how fun that book was?) So 665 pages of e-mails, that you don’t have to worry about answering, is spellbinding. Not to mention that Holly is very Bridget Jones-esque, yet not quite so incompetent. (Note here: I love Bridget Jones, and most other of the British chick-lit books…isn’t there just something delicious about the way British authors write?) It’s got the ridiculous aspects, but is also relatable…which is why this genre is so successful. For the first few hundred pages I was reading it because it was fun and entertaining. For the last couple hundred I was reading because I couldn’t put it down and wanted to know what happened next! It was kind of like eating guacamole; although there isn’t that much nutritious value, you just can’t stop eating! This book was SO MUCH FUN to read! Love it, and so glad there is a second book! This is book is for lovers over Bridget Jones, it has a bit of that feel. This whole book is only her e-mails. This would not be interesting nowadays, but this book is 9 years old. it is from the time we used e-mails to chat, in stead of WhatsApp or Facebook or whatever. Nowadays, this book would be her WhatsApp. So, you get all her chatting with her colleague, friends and family. And she chats a lot. You do know every This book was SO MUCH FUN to read! Love it, and so glad there is a second book! This is book is for lovers over Bridget Jones, it has a bit of that feel. Goodreads' 2 star review means 'it was okay', and that's what I thought of this book. It was just 'okay'. Too many pages, too many unnecessary emails and too much going on. In my opinion this book could have been over in half the pages. The book started off great but gradually began to falter as I quickly realised I found the characters confusing and the constant changing between email contacts made me feel really disengaged with the story, having to keep checking who was who. I really wanted to Goodreads' 2 star review means 'it was okay', and that's what I thought of this book. It was just 'okay'. Too many pages, too many unnecessary emails and too much going on. In my opinion this book could have been over in half the pages. The book started off great but gradually began to falter as I quickly realised I found the characters confusing and the constant changing between email contacts made me feel really disengaged with the story, having to keep checking who was who. When I discovered this book at Barnes & Noble, I immediately added it to my TBR List. I was quite surprised to learn my library owned a copy and was first on the wait list. I couldn't wait to begin reading Holly's e-mails. I was looking forward to reading this as I read so many glowing reviews. I have to admit, around page 200 or so, I lost interest in Holly and her friends. I really wanted to know Holly's back-story with Toby. It took awhile for Holly to disclose to Trisha, her co-worker. I d When I discovered this book at Barnes & Noble, I immediately added it to my TBR List. I was quite surprised to learn my library owned a copy and was first on the wait list. I couldn't wait to begin reading Holly's e-mails. I do have to say, the secondary characters were quite interesting and added to the story. Around page 415 (the reader was able to peek inside Trisha's inbox), I found myself glued to the story and couldn't put it down. Yes, it's a long book (665 pages of e-mails), but worth reading on a lazy afternoon. Even though I thought it was sluggish in the middle, I do hope there's a sequel in the works. I would like an update on Holly and her friends. I can say that this book was better then I thought it was going to be. Actually WAY better then I thought it was going to be. And talk about funny. I was laughing so hard reading this that my eyes teared up to a point where I couldn't see to keep reading. The more I laughed the more the people around me laughed. I hope there's more to come as it appears from how the book ended. If your looking for something that will crack you up and is a fast paced read, you really need to get this book. For more I can say that this book was better then I thought it was going to be. Actually WAY better then I thought it was going to be. And talk about funny. I was laughing so hard reading this that my eyes teared up to a point where I couldn't see to keep reading. The more I laughed the more the people around me laughed. I hope there's more to come as it appears from how the book ended. Recommends it for: fans of girly books. I came across this book in the library and being a sucker for swirly text, the jacket appealed to me. Meet Holly Denham, a receptionist who has managed to blag her job by embellishing her C.V. This book documents her relationships and conversations with her friends, family and colleagues, via her email in-box. While the format of this book may not be original, the characters never bore you, and I found myself cringing along with Holly. I will certainley be checking the inbox on the web in the co I came across this book in the library and being a sucker for swirly text, the jacket appealed to me. While the format of this book may not be original, the characters never bore you, and I found myself cringing along with Holly. I will certainley be checking the inbox on the web in the coming months to second book. Don't be turned off by this book's size - it's an incredibly quick read. I read the majority of it sitting by a pool in about 3 hours. Cute, entertaining (I must admit I giggled out loud...and more so as the book went on), but I must say the lack of character description made it so I wasn't left wanting more at the end. This has got to be the funniest book I've read in a loooooooooong time. Honestly, I could not stop laughing. There was not a boring page. It is utterly absurd and emotional and completely messes with your head. By the end, everyone is not who you thought they were in the beginning. Really, it was great. I loved it. Ahhhhhhhhhhhhhhhhhhhh. I want to read the sequel, but it's not available in the states and bookdepository is out-of-stock. Bah. It's a chick lit about Holly's life. Her romances, friends, job, boss, family. You can always find something you can relate to. I'm curious to know what will happen in the sequel. A very fun and light book. Dit was, back in 2007, een heerlijk boek. Dat ik hem nog steeds in gedachten heb en sinds vandaag pas weet dat er een #2 is zegt al genoeg! Ik ben geen boekenopgever, maar bij dit boek had ik het moeilijk. Het kwam erg traag op gang, bij momenten dacht ik dat mijn eigen inbox spannender zou zijn ;). Toen het verhaal me in zijn greep had, was het ook zo goed als voorbij. Voor mij dus niet echt een topper. Have you met Holly? She works as a receptionist for a big firm in London, despite the fact she has little experience. Her entire life is conducted through her inbox, offering an insight not many books are able to pull off. As she navigates her new waters, making new friends, getting back in touch with old ones, we get to see what it’s really like to work for a big firm. Throw in a couple of secrets Holly’s keeping and life is about to get a lot more interesting as they threaten to be let out. I think that if you haven’t already met Holly, my fellow Chick Lit fans, then I think you really should. Only, it has to be said, if you’re a fan of books told entirely via email. The book came to life after the success of the website http://www.hollysinbox.com which is set up like a real email inbox, honestly, it’s brilliant and you can actually read the entire book on the site. At least I think you can, so please don’t hold it against me if you can’t. The book is fiction, and it was revealed a while back that the author is actually Bill Hutton-Surie, but never fear the book is based on Bill’s own experience. Now, dear readers, I know what you’re thinking: How are you supposed to get to know a character through emails? For me, that’s easy because you can learn a lot about a character not only through their own emails but through that of their friends. So although I didn’t know what Holly looked like, I was able to know her through the emails she sent and through her friends and family. Along with Holly we also meet her two best friends Aisha and Jason, along with Holly’s completely madcap family and believe me, they are utter nutters, Holly’s family. Holly’s Inbox is a book you should be reading – or a website you should be visiting, there’s no doubt about that. I fell in love with her, and you will as well. The book is an absolutely mammoth 700 pages but don’t let that fool you, the pages whizz by so fast you’ll barely believe the speed with which you finish the book. I started reading it and the next time I checked my page count I was 100 pages in. I like it when a book can capture you so easily and I’ll be buying the sequel there’s no doubt about it. I don’t know what you’re doing still reading my email to you, readers, you should be buying this book immediately. As a fan of books such as Bridget Jones Diary, Meg Cabot's The Boy Next Door and Boy Meets Girl, I had already read a variety of books that use the email, or epistolary format in telling the story. While I like the playful way that this style shows the development of a relationship, there does seem to be some advantage to the author jumping in from time to time to guide the story. In the case of Holly's Inbox, all we get for the story comes directly from emails. Over half of the novel (which alt As a fan of books such as Bridget Jones Diary, Meg Cabot's The Boy Next Door and Boy Meets Girl, I had already read a variety of books that use the email, or epistolary format in telling the story. While I like the playful way that this style shows the development of a relationship, there does seem to be some advantage to the author jumping in from time to time to guide the story. In the case of Holly's Inbox, all we get for the story comes directly from emails. Over half of the novel (which although is made up of short emails, is still over 300 pages) is spent developing our idea of who Holly is, as well as the characters in her life such as her best friends who work at a hotel there in London, her parents who now live in Spain along with her grandmother, and her cohort at work who although sits next to her, spends her day emailing Holly and checking in. This set up of the basic plot and characters is amusing, but left me wishing for the bulk of the story that I was sure was to come. By the second half of the novel, a portion of the conflict has been revealed, and Holly is left to deal with what appears to be a messy social life, and a "friend" from her past who she refuses to speak to. We soon find out that this friend played a major role in her life, but not until the last moments of the book. It was during these last moments that I really got into the novel and wished I'd had more information. Holly is a new receptionist at a huge, bustling bank. She’s totally lost and in over her head, but things start looking up when she makes friends with some of her coworkers, finds old friends there, and even starts dating a handsome VP. Mixed in with e-mails with all of them are messages with her crazy family and best friends, a gay man and a… “promiscuous” girl. Soon, though, things begin falling apart for Holly at her new job when she gets dumped, gets back-stabbed, and an old flame joins the Holly is a new receptionist at a huge, bustling bank. She’s totally lost and in over her head, but things start looking up when she makes friends with some of her coworkers, finds old friends there, and even starts dating a handsome VP. Mixed in with e-mails with all of them are messages with her crazy family and best friends, a gay man and a… “promiscuous” girl. Soon, though, things begin falling apart for Holly at her new job when she gets dumped, gets back-stabbed, and an old flame joins the company, revealing her secret past and heartbreaks. I thought this book was slow to start. In fact, about 200 pages in, I set it aside to read another book that needed to be returned. Then, I picked it back up after I finished the other book and it got SO good. At first, it was just back and forth e-mails without much going on, then about halfway through, it really picked up! Lots of stuff went down and I was dying to know what would happen. Catty friends, crazy fun friends, handsome backstabbers, secret pasts… it had it all! The book is around 700 pages, BUUUUT, it’s all written in e-mail form so it’s quite a quick read. A lot of the e-mails are really short, and I wish some of them had actually been a bit longer, but overall, the book flies by. Holly and her friends were really likable and entertaining, while the couple of backstabbers were completely dreadful and made me SO angry. I think this book portrayed a variety of different relationships realistically, like with her grandmother and parents, and I liked that aspect a lot. I needed that. If you're looking for some light reading, this is your book. I have to admit, I wasn't too thrilled at first, and I still find some parts a bit problematic, but the characters grew on me, and the book flows really well. I love epistolary books, so this one was right up my alley. I loved getting to know the characters through their emails, and all the snark definitely improved my reading experience. There's one character who's just a B from Apartment 23, and I would have liked to u I needed that. If you're looking for some light reading, this is your book. I have to admit, I wasn't too thrilled at first, and I still find some parts a bit problematic, but the characters grew on me, and the book flows really well. I love epistolary books, so this one was right up my alley. I loved getting to know the characters through their emails, and all the snark definitely improved my reading experience. There's one character who's just a B from Apartment 23, and I would have liked to understand WHY she was being so mean and ridiculous. There were also some things left unresolved (one of which worries me quite a bit), and the ending didn't quite convince me. Also, I have absolutely no idea what the point of Pregnant Pam's character was as she has no relevance to the story other than to randomly pop up to torture the reader with images of puke and ducks. Don't ask. I was really excited to read this book, but it didn't quite meet my expectations. This book was about Holly, who started a new job at a finance/banking company and it's a look at her inbox at this new job. I love books in the format of emails back and forth, but this book had more gaps and things you had to "fill in" for yourself between emails than most others I have read in this format. There was also a lot you didn't find out about the main character until halfway or even further in the book. I was really excited to read this book, but it didn't quite meet my expectations. This book was about Holly, who started a new job at a finance/banking company and it's a look at her inbox at this new job. I love books in the format of emails back and forth, but this book had more gaps and things you had to "fill in" for yourself between emails than most others I have read in this format. There was also a lot you didn't find out about the main character until halfway or even further in the book. It totally changed your perspective of her and I'm not sure how I feel about these things being revealed SO very late. Because of this revealing taking so long, it felt like the romance was squeezed in at the very end, instead of having the reader spend the majority of the book hoping they would get together and letting that suspense build. There were also some problems about minor characters at the end of the book (I.e. Aisha) that were not resolved by the end of the book, so on a whole, it ended rather abruptly. I do realize there's a sequel and maybe that's why? Even though this book looks huge, it's a really quick read and I did enjoy the format. I also enjoyed the personalities of some of her friends/ secondary characters. I would read the sequel because of these reasons and am giving it 3 stars. I feel it could've been better done, but I mostly enjoyed it anyway. When I told a friend that the format of this story was that it was told through emails, he said that sound awful and then I pointed out that I chose to read the book after reading about it in Entertainment Weekly. So I read this bloated novel that started out as a cute idea, Have you ever wanted to peek into someone else's inbox? Unfortunately it just went on too long for me. I kept reading so I could see how it turned out but it was over 600 pages later that I finally felt satisfied with this t When I told a friend that the format of this story was that it was told through emails, he said that sound awful and then I pointed out that I chose to read the book after reading about it in Entertainment Weekly. So I read this bloated novel that started out as a cute idea, Have you ever wanted to peek into someone else's inbox? I can appreciate a light and fluffy beach read, but this one doesn't even make the cut in that category. It's long and rambling, filled with dumb innuendo and pithy exchanges. And I find the whole premise of using your work email exclusively for so much inappropriate communication pretty unrealistic. I would have given it one star, but the story finally picked up in the last quarter of the book, and it ended stronger than it began. Holly Denham could have benefited from a much harsher editor. Well, it really was fun! I loved this book! First of all, it's so different since the whole thing is told through emails. It's quite long but it's a quick, easy read; actually hard to put down. It really is the new Bridget Jones! I love British characters. If you like chick-lit, I highly recommend Holly's Inbox. Certainly unique with it's email format and British wit this is a really fun read. fun, cheeky and impulsive. A good read to just sit and have fun. Wow, this book was terrible. Nearly 700 pages with a plot line that could be told in 30. Off the chart funny, and emotional. You will stay up all night reading this book. The pages fly by because of the format i.e. email. Can't wait to see what happens in the next book!! 3- Can I get your number by Sophie Kinsella... told a lot in text.. m Off the chart funny, and emotional. You will stay up all night reading this book. The pages fly by because of the format i.e. email. The premise was good but after about a third of the way into the book, the email format was annoying. Frankly, the email format slowed me down with my reading speed and I found myself having to look at who was emailing who to stay on track. Also became rapidly tired of her partying, sleeping around female friend. I'm not sure why I stuck with this one. Credit where credit is due, the author managed character development and plot in an all email form and that in itself was a neat change of pace. I didn't care for the storyline and I didn't find it to be funny. Consider it personal preference - not my cup of tea but not horrible. But what was the point of the Pregnant Pam character?? Uit! Eindelijk! Ik heb drie en een halve week gedaan over een boek van zeshonderd pagina's dat helemaal in mailvorm is geschreven. Dat is niet van mijn gewoonte. Op zich was het een leuk boek, hoewel ik met momenten gruwelde van de vertaling. Ik had ook het gevoel dat het einde nogal snel snel ging. Dat terwijl het begin van het boek maar bleef aanslepen en er toen helemaal niets gebeurde. Boe. The character Holly isn't based on anyone in particular, however I think a lot of her quirkiness has come from my wife - she's very quirky. The idea for the site came one day when we had to trawl through an ex-employee's work email account. The woman in question was singl Holly Denham is a fictional author created by Bill Hutton-Surie.